One of the great virtues of emojis are their ability to mark tone where plain text cannot. A simple ❤️ Red Heart can add affection to a text message. A string of 😂 😂 😂 Face With Tears of Joy can show we find something funny in a social media post. Yet in the small space of an emoji, it’s not always so easy to encapsulate the full complexity of our emotions. Consider 😏. On the Apple keyboard, 😏 shares its raised brows and comma-shaped side-eyes with 😒 Unamused Face, but boasts a half-smile cocked up to the left instead. 😏 is definitely amused in some way, but how, exactly? It’s time again for some emojiology. Above: On Apple's keyboard, the Smirking Face emoji (left) and the Unamused Face emoji (center) share the same eyes but very different smiles. 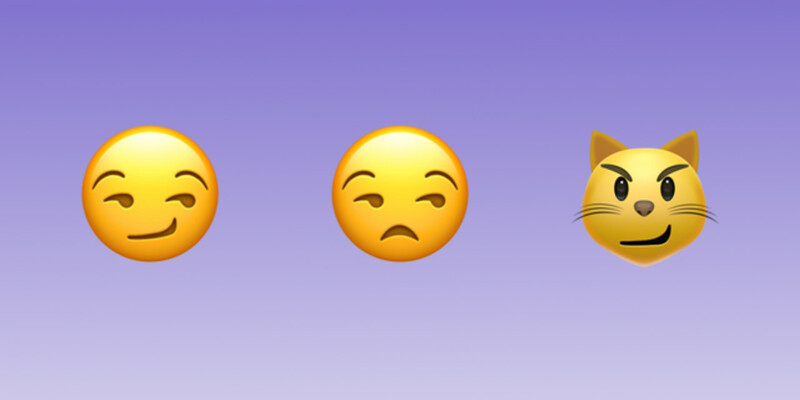 The Smirking Face emoji also has a cat smiley variant (right), Cat Face With Wry Smile. As its official name reveals, 😏 Smirking Face represents the facial expression of a smirk. It’s used to communicate a range of feelings, including smugness, self-confidence, self-indulgence, mischief, cheeky humor, and general satisfaction. 😏 Smirking Face especially implies, however, flirtation and sexual innuendo. 😏 Smirking Face popularly debuted in 2010 with its approval under Unicode 6.0. Apple did include the emoji, though, in its initial implementation of emoji support as part of iPhone OS 2.2 in 2008, though on a limited basis in Japan. Above: How the Smirking Face emoji displays across platforms. Note that only Mozilla's smiley looks straight ahead. Wedged between 🙄 Face With Rolling Eyes and 😣 Persevering Face, 😏 Smirking Face bears some notable similarities—and contrasts—on different keyboards. Across the major platforms, the character sports a knowing smile upturned to the face’s left, though its length and sharpness widely vary. The smiles on Google and Microsoft’s 😏 Smirking Face, for instance, have softer curves, portraying a shyer, kinder-seeming smiley. 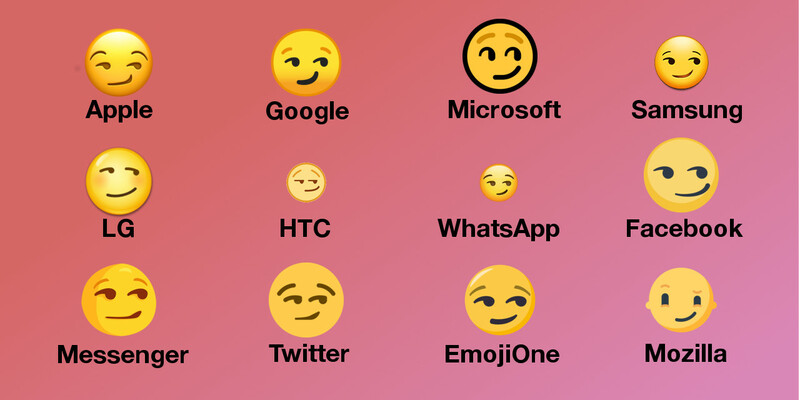 LG and Facebook leave out eyebrows, while Mozilla alone depicts eyes looking straight ahead; the rest of the smileys squint impishly to their left. 😏 Smirking Face christened Twitter in May 2011, and skyrocketed on social media later that summer with Apple’s release of OS X Lion, which supported emoji for its desktop computers. In 2015, Snapchat thrust 😏 Smirking Face into further prominence when it launched Friend Emojis, a feature designed to help users manage their contacts on the messaging app by using emoji to symbolize friendship statuses. Among them was the 😏 Smirking Face, which means: “You are one of their best friends…but they are not a best friend of yours. You don’t send them many snaps, but they send you a lot.” With its 😏 Smirking Face, Snapchat implies the messaging imbalance is a dirty little secret the favored friend can take some pleasure in. I feel rly uncomfortable with the new snapchat update there is a "😏" emoji next to a conversation with my mum wtf ???? Snapchat may have made @emilypugh_ feel “uncomfortable” because of 😏 Smirking Face's increasing use to signal flirtation or punctuate suggestive remarks in internet dating culture in the late 2010s. In 2017, Clover analyzed emoji behavior on its dating app, and the 😏 Smirking Face ranked among the top emojis that users were likely to reply to on the platform—#4 for women and #1 for men. Some guy I don't know messaged me on Facebook saying "Hey 😏" then *____sent a photo* then "You know you like it, just accept it." Definitely not opening that chat. 😏 Smirking Face exhibits meanings as many and as subtle as the complex facial expression that inspired it—hence it also answers to the names Flirting, Sexual Face, Smug Face, or Suggestive Smile emoji. Let’s highlight some of the diverse shades of 😏 Smirking Face. As we’ve seen, 😏 Smirking Face is widely used to communicate an array of sentiments. The emoji can be just what we need to mic-drop a wisecrack or spice up some banter, but its ambiguity can cause some awkwardness. Be particularly mindful of its negative and suggestive connotations when using 😏 Smirking Face, especially as its appearance varies across platforms. One person might see 😏 Smirking Face as an innocent smile or friendly wink while another might interpret it as conceited, untoward, or even lewd. And remember, for all the similarities in their eyes, 😏 Smirking Face is not the same as 😒 Unamused Face. To avoid any “uncomfortable” miscommunications, consider pairing 😏 Smirking Face with, well, 😂 Face With Tears of Joy if intending humor or ❤️ Red Heart, if romance. Perhaps 😎 Smiling Face With Sunglasses, which often accompanies 😏 Smirking Face, can help more clearly maintain the sense of cleverness or contentment. Or try 😏 Smirking Face's less loaded feline counterpart, 😼 Cat Face With Wry Smile. We all know cats are unmistakably smug 😏😏😏.